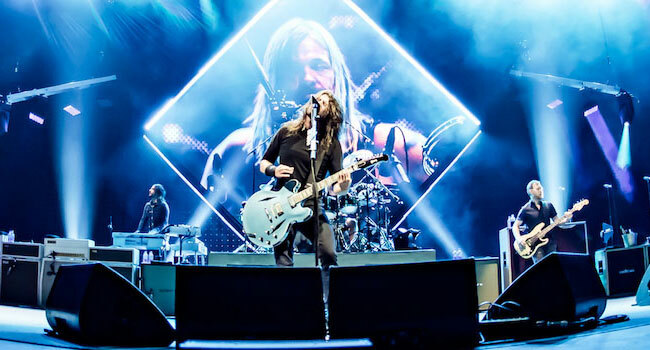 Legendary rock band Foo Fighters will perform at this year’s DIRECTV Super Saturday Night on February 2nd in Atlanta, the evening before the Big Game. Tickets will go on sale to the public on November 30th at 9 am ET through Ticketmaster.com. DIRECTV has celebrated the weekend of the Big Game for 13 years with one-of-a-kind fan experiences and performances. This year, an intimate custom-built, three-tiered, 72,000 square-foot venue will be constructed at Atlanta Station. The venue concept was envisioned by long-time producer Jack Murphy, a veteran of delivering of world-class venues, and brings together an incredible creative and high-end nightlife experience. DIRECTV Super Saturday Night at Atlantic Station will be perched at the crossroads of the two major thoroughfares in the heart of the city. The venue, built from the ground up, and event will employ more than 200 seasonal labor, staffing, servers and security. Murphy and AT&T teamed up with several local vendors, hotels and restaurants from the local Atlanta community to create an unforgettable experience. In the 23 years since the 1995 release of their self-titled debut, Foo Fighters have won 12 Grammy Awards, sold 25 million records and continue to pack arenas and stadiums the world over. The band’s ninth and most recent album, Concrete and Gold, was released in September 2017, debuting at No. 1 in more than a dozen countries, including the U.S., the UK, Australia, New Zealand, Canada, Ireland, Norway, Austria, Greece, Japan and the Netherlands. The album’s arrival was heralded by the surprise release of the Billboard Mainstream Rock No. 1 smash summer anthem of 2017, “Run,” which took “Best Rock Song” honors at this year’s Grammy Awards.